Bailey and Bronco are a bonded pair of Bully Breed Mixes. Bailey is a three-year-old female, and Bronco is an almost four-year-old male. Bronco was with us at Valley Animal Center once before when he was just a year old. After only a few short months, Bronco was adopted and found a new home. Just recently, Bronco came back under the care of Valley Animal Center; this time with his best friend Bailey. Unfortunately, they were both left abandoned at Fresno Bully Rescue with no explanation from their previous owners. When FBR scanned Bronco for a microchip and found he had been chipped at Valley Animal Center, they called us so we could bring him and his new friend back into our care. 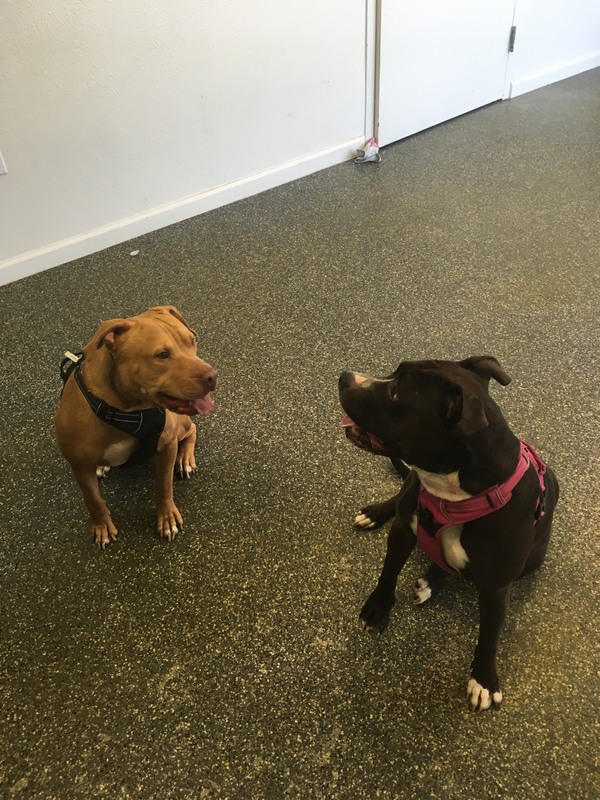 Bailey and Bronco were both members of our on-site dog park, and they transitioned well into our Dog Adoption Center. Unable to be separated, they share a kennel together on our adoption floor. Bailey is very high energy, and zooms around the park whenever she’s taken for a walk. Bronco on the other hand is very mellow and prefers to watch his friends play, joining in when he finds the right toy to play with. 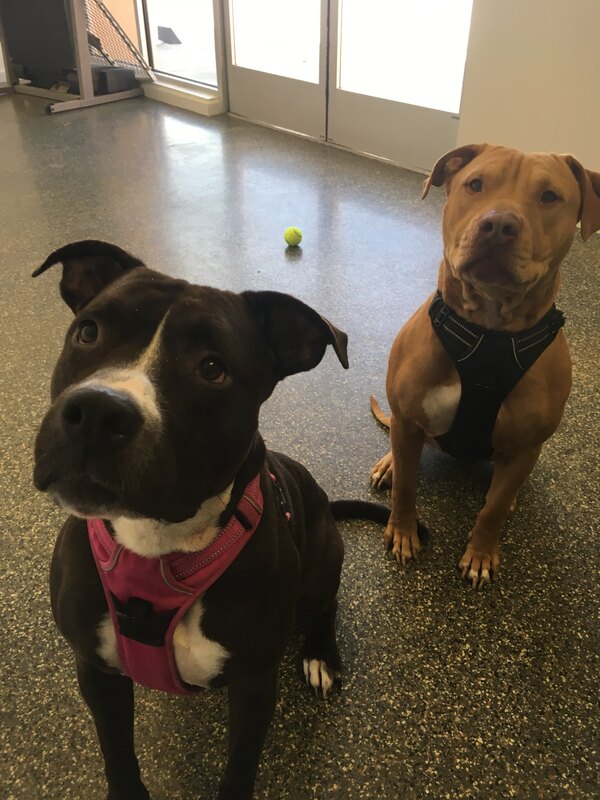 Bronco and Bailey are both friendly with children and get along well with other dogs, though Bailey can be a little overwhelming for smaller dogs due to her high energy level. They would be great for a home with or without other pets and would love a family who would take them both out for long walks. Because they are so bonded to each other, we are hoping they can find a new home together. When separated, they constantly search for each other, and it would be best for both of them to remain in a home together. 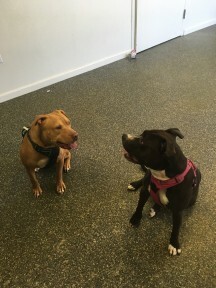 Having already been in a home outside of the shelter together, they would likely transition well back into a home environment given the proper time and training. 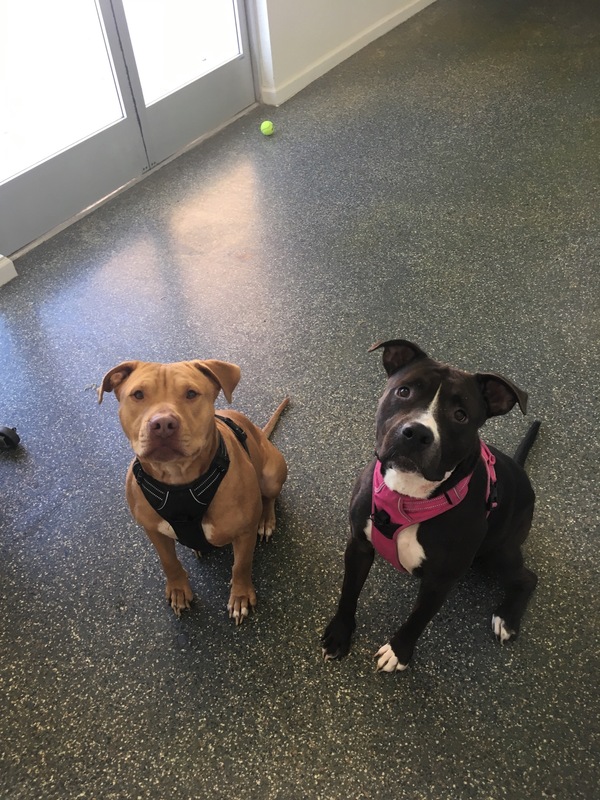 Like all of our adoptable animals, Bailey and Bronco have already been spayed/neutered, are up-to-date on their vaccinations, and are micro-chipped. You can come by to visit both of them in our dog adoption center seven days a week from 10 a.m. to 4:30 p.m. If you would like more information about any of our adoptable animals, please call or visit Valley Animal Center. I think nearly ALL dogs need another dog in the family; as much as we like to think we can provide everything our dogs need, in reality we can’t. We aren’t DOGS! Some dogs can live with another dog for years and not become ‘bonded’, while with others it may take less than a week before one (or both) becomes upset, anxious, fretful when separated from the other dog. Glad this group is trying to place them together — hope they do!